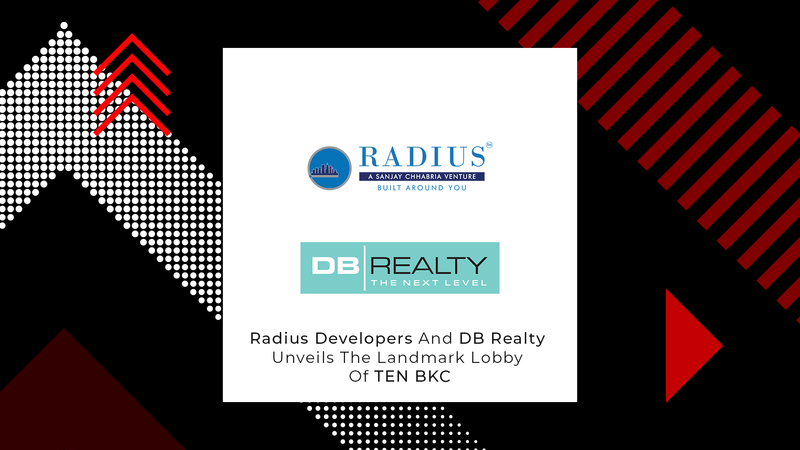 Radius Developers and DB Realty, leading luxury developers in Mumbai, unveiled the landmark lobby of their flagship project, TEN BKC. The elaborate 35,000 sq. ft., double height lobby, evokes grandeur and style in its truest form. Designed by the world-renowned architect and design firm Aedas Hong Kong, the lobby is already setting new benchmarks in luxury. It features an ultra-chic cutting-edge design, and is tasteful and classic, amidst modern renovations. It has a fireplace inside, which serves as a trendy, yet the intimate place, to spend time with friends, family, and loved ones. As a result, the lobby at Ten BKC is a notch above some of the most extravagant and lavish hotel lobbies one has ever seen, creating a whole new benchmark for residential lobbies in India. Offering an awe-inspiring confluence of luxury and grandiosity, it delivers perfectly on the promise of resplendent urban opulence, right at one’s home. The architectural intricacies of the lobby are just one of the many excellent features that set TEN BKC apart from other projects in the vicinity and provide a glimpse of the luxurious lifestyle that the project has to offer. TEN BKC is strategically located in Bandra (E), with close proximity to BKC, one of the largest Central Business Districts in Mumbai, which encourage the ‘Walk to Work culture’. The project is surrounded by some of the best luxury hotels, international schools, healthcare facilities, and recreational clubs. It also has a unique, Z-shaped layout, offering maximum privacy, and absolutely picturesque views. The meticulously designed facade gives the building a premium look, owing to being open on all sides, with no shared boundary wall. Post unveiling; within a short duration of its existence, the lobby has already received exceptional feedback from TEN BKC customers. While most guests were enamored by the sheer grandeur of the lobby, the more artistically inclined praised the venue’s architectural perfection. Radius aims to reshape the contours of luxury Real Estate in Mumbai with inspirational creations and mesmerizing architecture. The group is currently developing residential, commercial, and township projects spread across 20 million sq. ft. with 21 landmark projects. The company has delivered 7 million sq. ft. of prime residential and commercial development, and has recently won the “Best Commercial Building Award” for its flagship project, “One BKC”, by CNBC Awaaz Real estate awards 2017-18. Radius is an independent foray in real estate by Mr. Sanjay Chhabria, who is a renowned and respected member of Mumbai’s real estate fraternity.